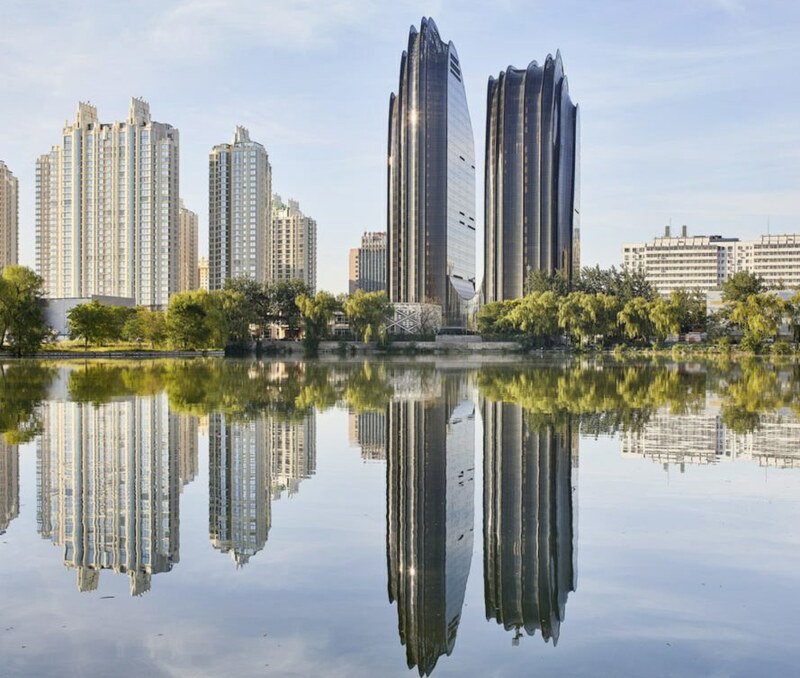 Many of Asia’s high-rises may seem indistinguishable from those in the West, but MAD Architects’ recently completed Chaoyang Park Plaza puts a unique Chinese spin on skyscraper design. 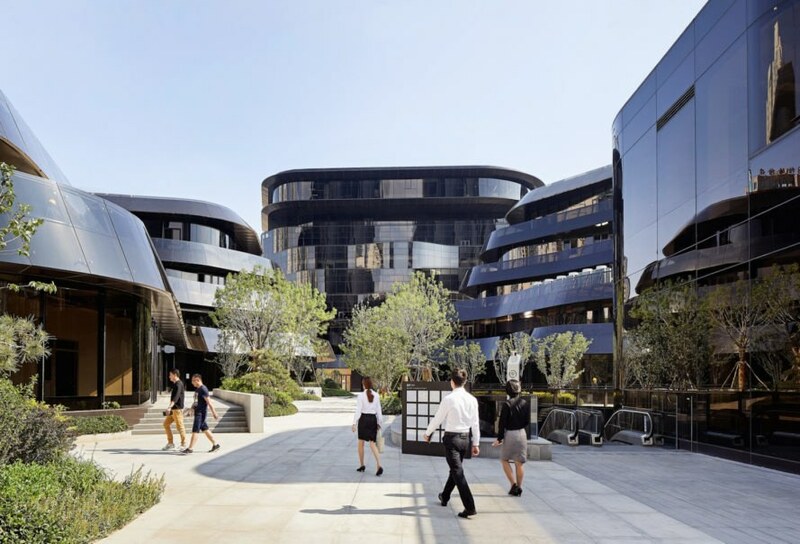 Located in Beijing’s central business district, the mixed-use development takes inspiration from the ‘shan shui’ style of traditional Chinese landscape painting that emphasizes balance and flowing lines. The mountain-like buildings, lush vegetation, and water features evoke an oasis of nature in a dense concrete jungle. 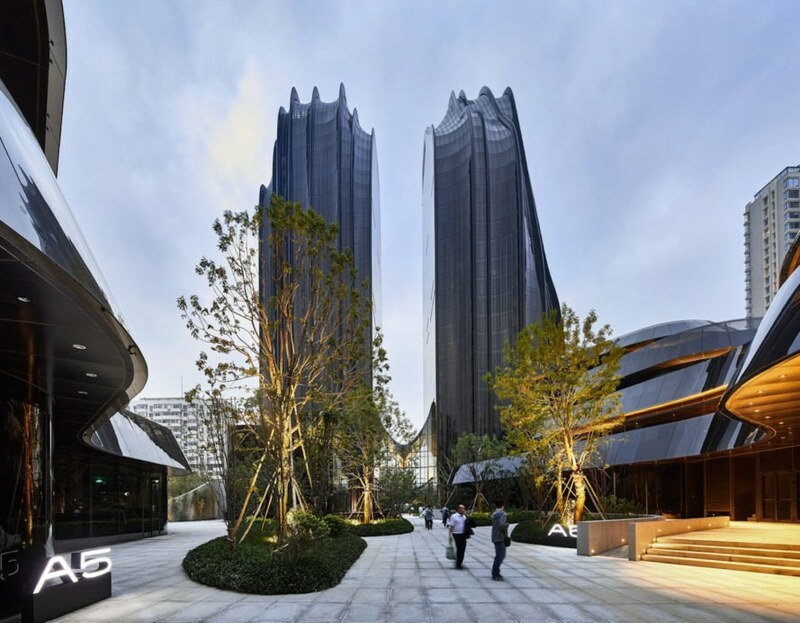 The 220,000-square-meter Chaoyang Park Plaza comprises 10 buildings that eschew modern boxy forms for the curved forms commonly found in shan shui paintings. 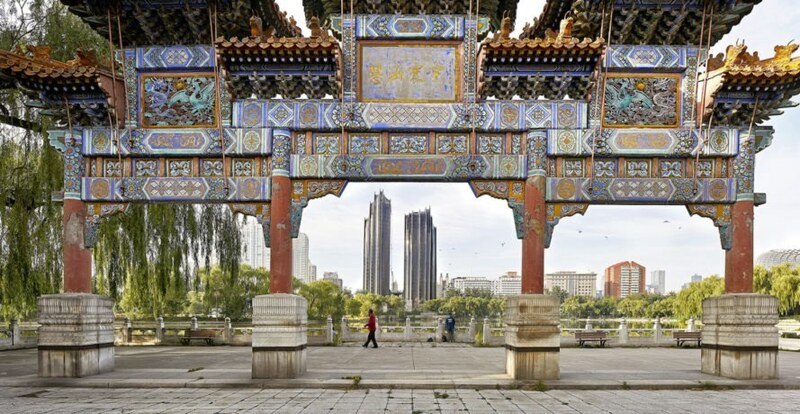 “It is an extension of the park into the city, naturalizing the CBD’s strong artificial skyline, borrowing scenery from a distant landscape ─ a classical approach to Chinese garden architecture, where nature and architecture blend into one another,” wrote MAD architects. The pedestrian experience shares similarities with walking through a river valley with meandering pathways, flowing water features, traditional Eastern landscape elements like bamboos and pines, and organic boulder-like shapes. Offices will be housed in the two largest buildings that look like a pair of asymmetric mountains, as well as one of the lower-lying buildings on the south side of the site. Shorter buildings shaped like round river stones contain commercial space, while two Armani towers on the southwest side contain residences. 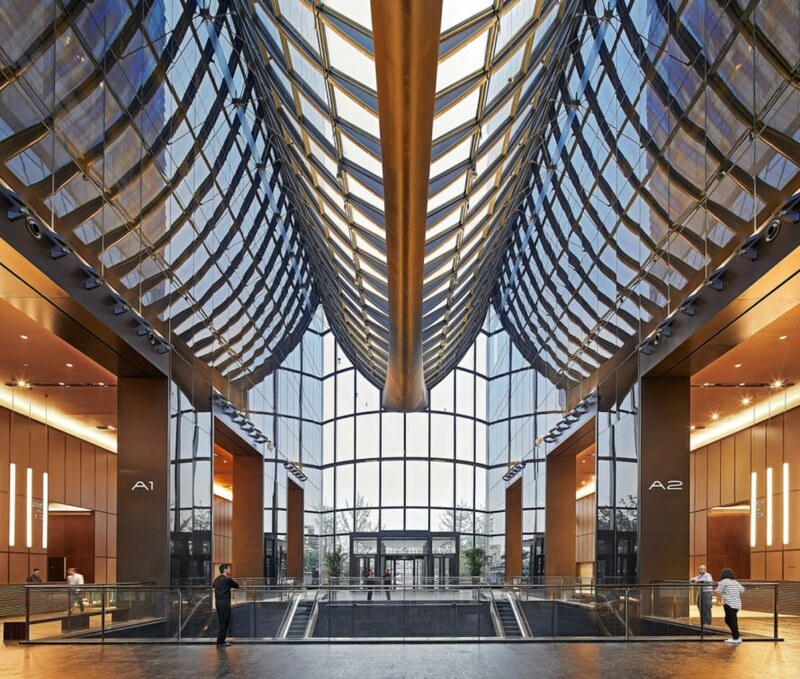 The project earned LEED Gold certification for its use of vertical fins on the exterior that have the double benefit of mitigating solar gain and emphasizing the smoothness and verticality of the towers. 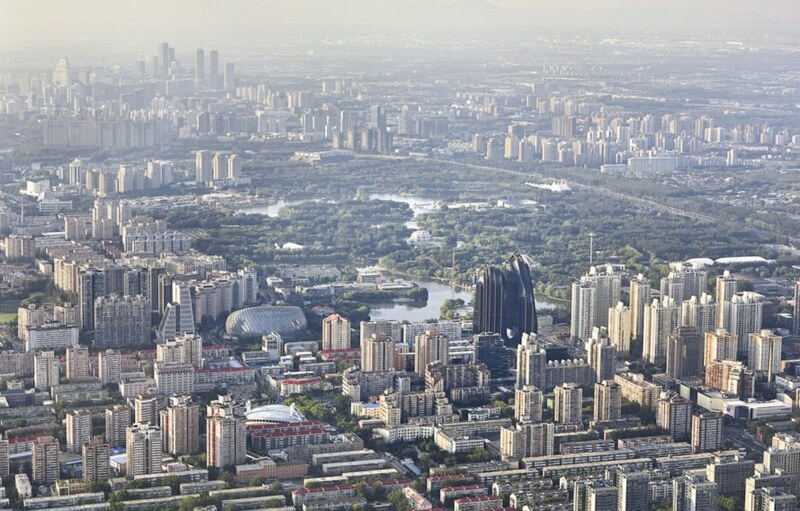 To combat Beijing’s sweltering summers, the architects installed a pool outside to serve as an air-cooling system and designed the building systems to draw in fresh air. 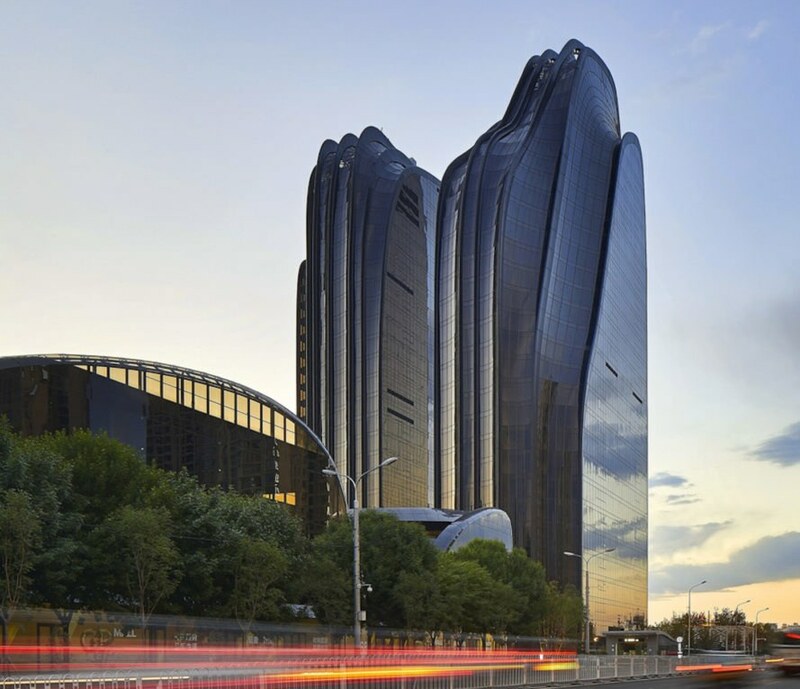 The 220,000-square-meter Chaoyang Park Plaza comprises 10 buildings that eschew modern boxy forms for the curved forms commonly found in shan shui paintings. 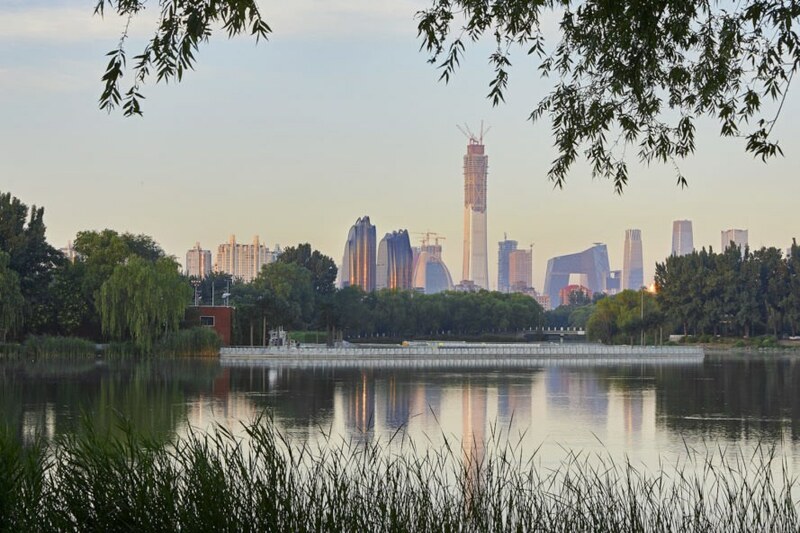 “It is an extension of the park into the city, naturalizing the CBD’s strong artificial skyline, borrowing scenery from a distant landscape ─ a classical approach to Chinese garden architecture, where nature and architecture blend into one another,” wrote MAD architects. The pedestrian experience has similarities to walking through a river valley with meandering pathways, flowing water features, traditional Eastern landscape elements like bamboos and pines, and organic boulder-like shapes. Offices will be housed in the two largest buildings that look like a pair of asymmetric mountains, as well as one of the lower-lying buildings on the south side of the site. Shorter buildings shaped like round river stones contain commercial space, while two Armani towers on the southwest side contain residences. 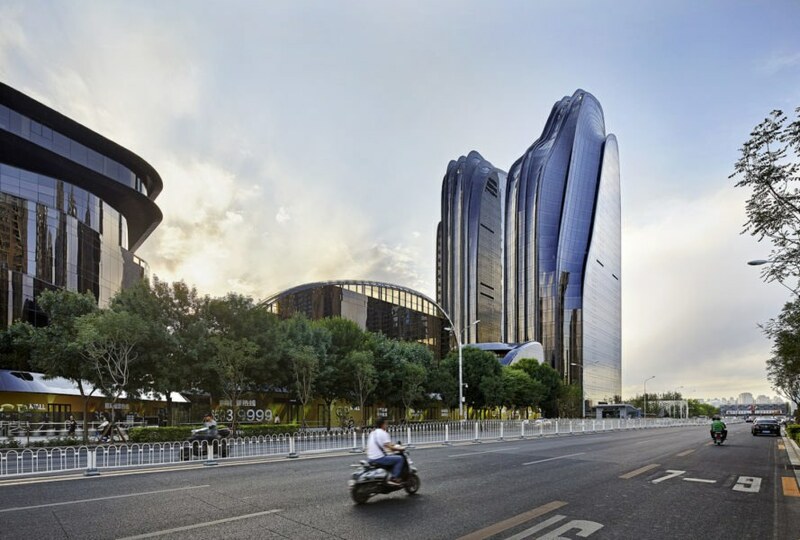 The project earned LEED Gold certification for its use of vertical fins on the exterior that have the double benefit of mitigating solar gain and emphasizing the smoothness and verticality of the towers. 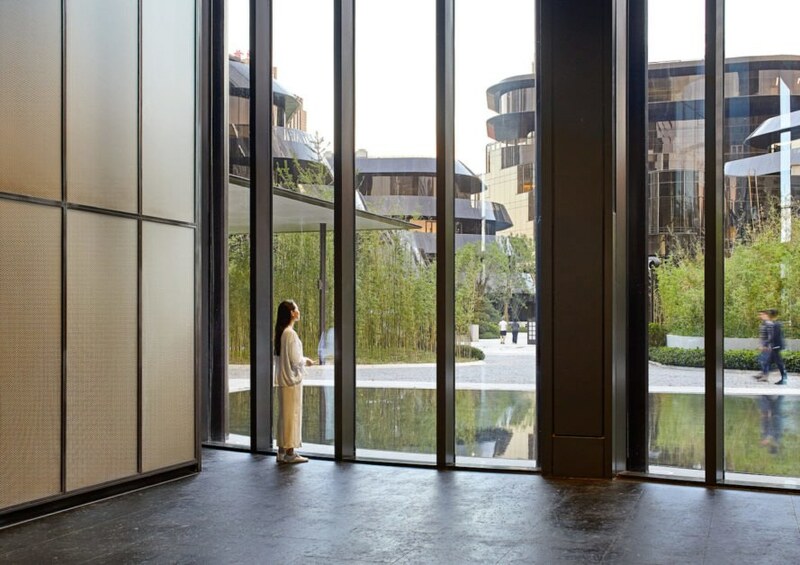 To combat Beijing’s sweltering summers, the architects installed a pool outside to serve as an air-cooling system and designed the building systems to draw in fresh air.